Jason goes to Puerto Rico: You WILL eat Tostones. And LIKE it. Greetings, Daisy’s webmaster and good friend Jason Perlow here. I know Boriqua Blog is a site for all things Daisy, but trust me, you’re really gonna like this series of posts. I can’t promise to have Daisy’s sense of humor and bubblicity, but I can definitely show you some good food. Some of you may know me from my food blog, Off The Broiler, and the culinary food discussion site eGullet which I co-founded in 2001. Daisy and I met three years ago when she did a podcast for my blog which if you’re a big Daisy fan I encourage you to listen to. 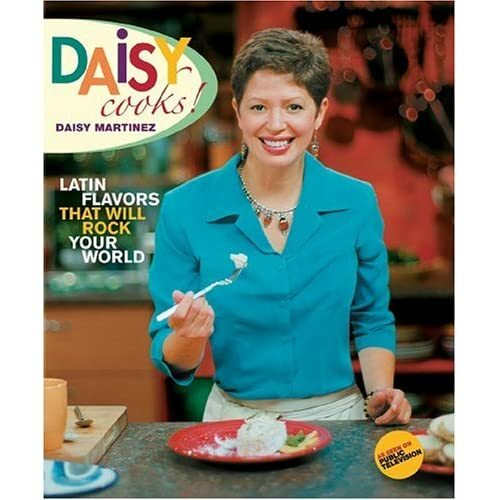 At the time we did that podcast, I was a big fan of her show, Daisy Cooks! on PBS. We became great friends, and eventually, I helped her build DaisyMartinez.com and Boriqua Blog. I’m sure of you many of you are aware that Daisy is of Puerto Rican heritage. I, on the other hand, am an estadounidense — an American, and specifically Jewish and of Eastern-European descent. While I can speak Spanish semi-fluently — I studied it in college and I grew up learning it in my household because my mother has a masters degree in Spanish, I never truly understood what it meant to be a Latino. Sure, I’ve travelled to several Spanish-speaking countries, including Spain, Mexico, Colombia and Panama, but in those trips, I’ve never truly “gone native”. Even in my previous travel to Puerto Rico, I stayed within the confines of the Caribe Hilton and the tourist areas of San Juan, and never ventured out to see what America’s foremost tropical island was really all about. The next time I went, I vowed that it would be different. Palmas del Mar, Puerto Rico. I recently returned from a trip to Puerto Rico with my wife, Rachel, and we stayed in the Palmas del Mar resort near Humacao, which is on the Southeast side of the Island. The majority of the places we visited were along the Southern and Eastern side of the island, so if my report looks a little skewed for not featuring cuisine and culture on the West and Northern parts, you’ll understand. While not as large in terms of landmass as the two other Caribbean islands such as Cuba and Hispaniola in the Greater Antilles, Puerto Rico is still pretty big and is really too large to try to get a full sense of in just one week — it’s still the size of Connecticut, and despite having several autopistas it still has a lot of one lane roads which prevent fast cross-country travel. 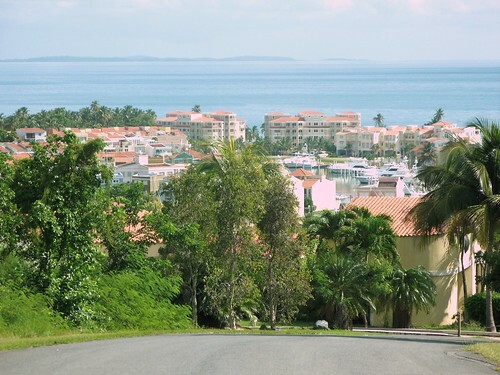 A trip from Humacao in the east to Rincon or Aguadilla in the western part of the island can easily take more than 3 hours, particularly if you need to go thru mountain roads for part of the trip. I knew a decent amount about Puerto Rican and Caribbean food before this trip — I’ve been to other Caribbean islands such as Jamaica, Aruba, St. Thomas and St. Maarten, and of course I have prepared food from Daisy’ show and from her cookbook, and have eaten many of these dishes at Cuban, Dominican, and Puerto Rican restaurants in New York, New Jersey and Florida. But even so, nothing really prepares you for eating in real Puerto Rican restaurants in its country of origin as opposed to places that are geared more towards tourists. Puerto Rico is certainly no exception to tourism or Americanization — in fact, I’d say that since Puerto Rico is a US territory, its become more Americanized probably than any other country in the Caribbean. Legit Puerto Rican eateries serving the native Crilollo (creole) cuisine are becoming fewer and far between, as mom and pop restaurants are giving way to big American fast-food chains and old neighborhoods are being demolished in favor of luxury condominiums for wealthy Americans. It’s not unusual to drive into a modestly-sized town and find within less of a 1/4 of a mile of each other a Burger King, a McDonalds, a Wendy’s, a Church’s Fried Chicken, a KFC, a Pizza Hut, a Domino’s, and Pollo Tropical. I’ve even seen a Krispy Kreme and Wal-Marts and COSTCOs. The only difference between these chains in Puerto Rico and the ones in the US is their menus are in Spanish. 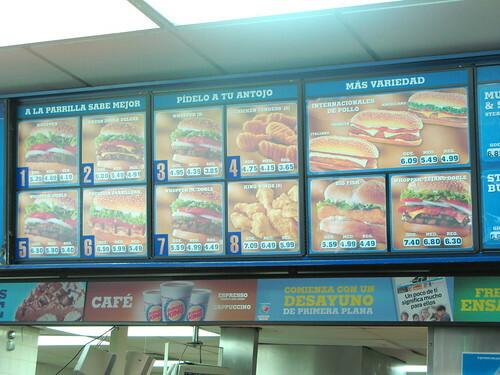 A Burger King menu from Puerto Rico. And you know what? Puerto Ricans are all eating at these places, not necessarily tourists. Sadly, a lot of independent Puerto Rican restaurants have closed down or limited their hours due to the economy — the island has been experiencing a deep recession for about 4 years now. Now that I’ve gone ahead and gotten you all depressed, the good news is real Puerto Rican food in Puerto Rico does exist, but you have to make an effort to seek it out. The first thing you should probably know about Puerto Rican and a lot of other Caribbean Latino food is that much of the traditional diet is heavily based on starches and proteins. Green vegetables are practically non-existent, and the preferred method of cooking is frying or sauteing in oil and animal fats. If you’re looking to keep the pounds off, I strongly suggest you stay the hell away from Puerto Rico. However, if you want to eat some of the tastiest Caribbean food in existence, Puerto Rico is your kind of place — just be prepared to hit the stairmaster and eat mass quantities of spinach and leafy veggies when you get home. 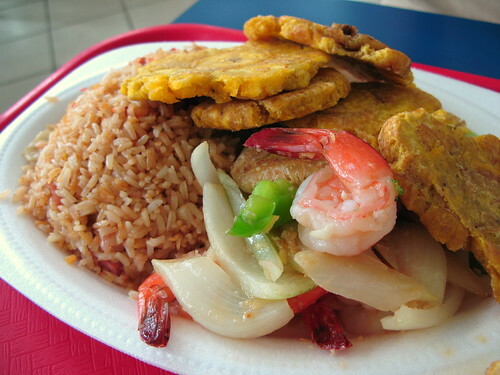 The three big staples in Puerto Rico are Beans, Rice, and Plantains. While some might say that the first two really define the cuisine, from my own experience, I’m gonna have to say that they play second fiddle to the mighty platano. 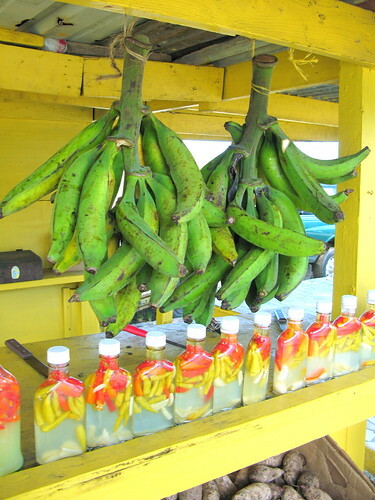 Green Plantains at a roadside stand in Fajardo, Puerto Rico. Plantains are eaten in a number of different forms in Puerto Rico. When fully matured and gone towards yellow-black, they are sweet and fried in butter and eaten as Maduros. Their most common method of consumption is when they are in their green state, sliced into chunks, washed in water and seasoned with salt, pepper and garlic, slammed into disks (usually with a coffee can, a brick or a device known as a tostonera) and then deep fried into tostones. To say that I sampled tostones in Puerto Rico is an understatement. I think i can say with fair certainty that I consumed more tostones in a single week than human beings should be allowed. Tostones at El Roble Restaurant in Salinas, Puerto Rico. The photo above depicts a typical preparation of Tostones. We probably had these with literally EVERY meal we ate in Puerto Rico, and that doesn’t count the fact that we would also have plantains in other forms during the meal as well, such as mofongo and maduros (which we’ll get to in another post). Typically, they are served with ketchup as well as a Ketchup/Mayo dipping sauce mix. I’d like to say I got tired of eating tostones in Puerto Rico, but I can’t. 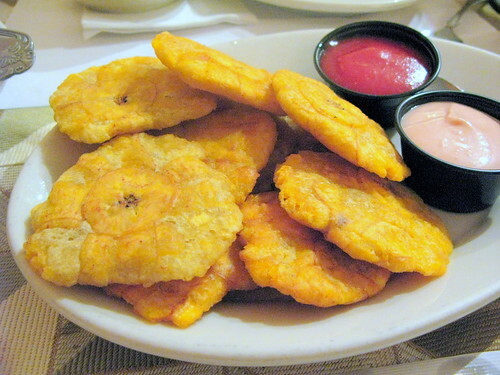 Tostones are even better than the best french fries — they are like crack and are Plantainalicious. Tostones con ensalada de Carrucho, at the Sheraton Las Palmas in Humacao. 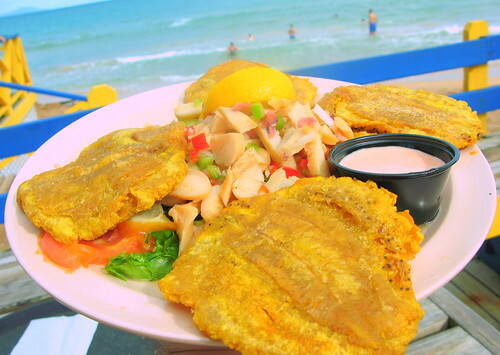 Above are tostones served with a Conch Salad. Conch, or Carrucho, is a very popular seafood, and for the lack of a better description is the chopped up innards of a giant marine snail. In other Carribean cuisines, conch is typically made into fritters and put into chowders, but in Puerto Rico its most commonly served as a simple salad with lime juice, olive oil, chopped up red onion and celery. This salty dish goes great with the fried tostones, and when you’re at the beach sipping an ice cold beer, it’s hard to beat. Toston Relleno filled with Lobster at Paradise Seafood in Punta Santiago, Puerto Rico. 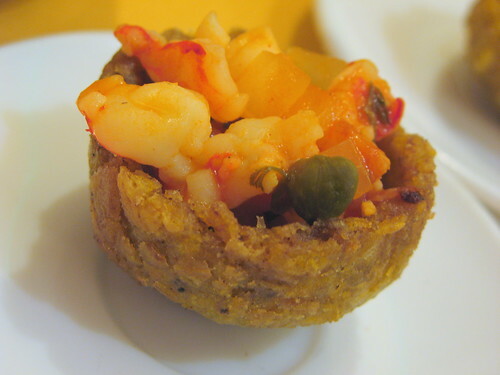 Tostones are also frequently made into cup-like shapes and also filled with lots of tasty stuff, such as lobster and other kinds of seafood, as shown above. Tostones Rellenos de Panfruta con Salmorejo de Jueyes at Caracoles Restaurant in Palmas del Mar, Puerto Rico. Tostones can also be made out of other starchy vegetables besides plantains. 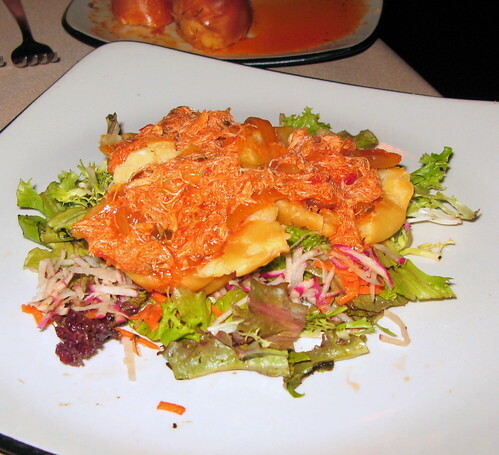 One of the most memorable ones we had was at Caracoles restaurant in Palmas Del Mar, which used deep fried breadfruit cups filled with Salmorejo de Jueyes (Crab Stew) over a really nice salad — the only decent salad we ate the entire time we were on the island. Salmorejo de Jueyes is also another dish we probably ate way too much of in Puerto Rico, but again, we’ll get to that soon. Tostones Rellenos de yuca con camarones ajillo, at Ajili Mojili restaurant in San Juan, Puerto Rico. We also had an excellent stuffed tostones at Ajili Mojili restaurant in San Juan. Ajili Mojili is a fancy Crilollo restaurant in the really expensive Condado neighborhood where all the luxury hotels are, so naturally its incredibly overpriced. 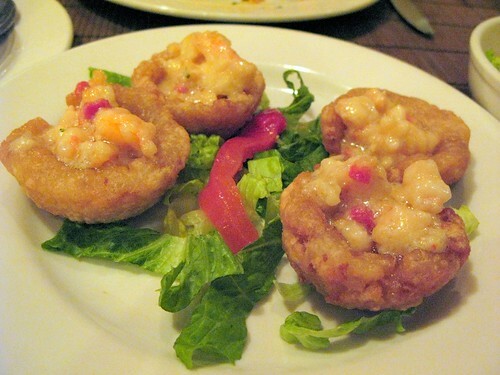 However, these Yuca tostones filled with garlic sauteed shrimp were the highlight of the meal. Lastly, but not least, I would like the point out that tostones are so important to Puerto Ricans that they have even been extended to non-Crilollo cuisine. Why, you can even expect to get it with Chinese food. Yes, really. 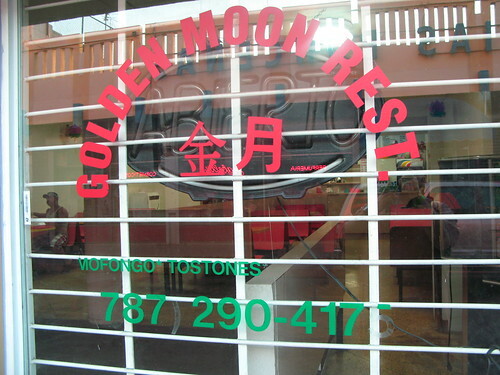 A Chinese restaurant in Ponce, Puerto Rico. Egg Foo Yong de Carne Ahumada con Tostones y Arroz Frito, at China Sun Restaurant in San Juan, Puerto Rico. This comprehensive tostone tutorial has my mouth watering at 8AM! My fave is the tostone with egg foo young…that takes the prize in my book! Thanks for this great post, Jay, and make yourself comfortable on BBlog, anyday! I loved the review/tutorial session. Now I need some tostones. By the way- the correct term is Criollo or criolla NOT Crillolo. Thanks Jason! I enjoyed your post very much. My husband, Rene is Puerto Rican and spent most of his life in Puerto Rico. Thank God he moved to Texas in 1992 so we could meet and marry! We just had tostones last week with whole fried Red Snapper and it was delicious! I don’t know that I could eat them with every meal. I enjoy variety. Rene used to go down to the beach in Puerto Rico every Sunday when the fishermen would bring the fish in fresh and it would be fried right there on the beach. He told me he purchased the fish raw one time and tried to fry it himself but made a real mess of it so he never tried it again. Our fish turned out great! You are so right about the green vegies, well to tell you the truth, vegies period with my husband! He eats very few vegetables, but lots of rice and beans and pork. Hi Jason and nice to meet you. I actually got to know about you from your various technology posts for Linux Magazine and ZDNet. 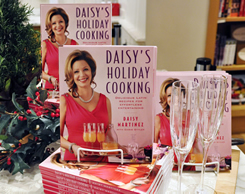 I didn’t realize you were such a food aficionado until I became a Daisy-fanatic about a couple of years ago. You’re a man of wide and eclectic hats! I would call you “El Judeo Maravilloso” if it weren’t already taken by that great salsero, Larry Harlow! This post really caught my eye (even though you’re not Daisy) when you mentioned your trip to Palmas, which is just a stones throw away from my mothers house in Humacao. I’m glad you finally ventured out into the Island and away from the touristy San Juan area because that is where you will find the true flavors of La Isla. And you’re absolutely correct when you mention how those flavors are getting more and more Americanized, or rather on the fast-food track. It’s a shame, really. I have to agree with La Daisy – this has to be the most exhaustive piece on platanos and tostones I have come across in years. Bravo! Keep this up and the phrases “chevere” and “wepa, wepa, wepa!” will be rolling off your tongue in no time! Again, great post. You ventured out and saw what I keep telling all my friends when they go visit. The best places are inland for seeing the beauty, experiencing the culture, and tasting the flavors that is La Isla del Encanto. BUT, be prepared to gain at least 15 pounds! Mike – that’s the Americanized Miguelito! 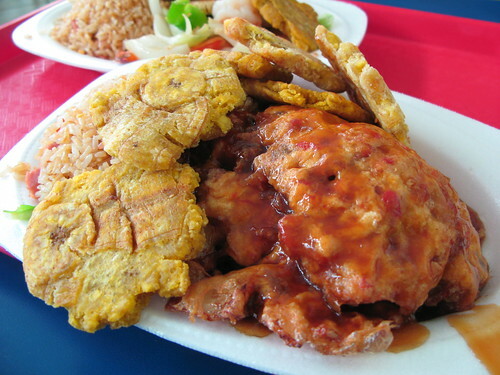 One can’t possible think of Puerto Rico without visions of tostone piled platters filling their heads. Once you eat a tostone, french fries are out the window! Wow! Those pictures made my mouth water! I love the picture of Palmas Del Mar. My inlaws live in Carolina Puerto Rico, but I have never been there yet to visit them. But like Mike, my inlaws will probably cook us so much good food we won’t even get to go out and taste the local food. I absolutely love plantains and I’m always looking for new ways to cook with them and your picture of toston relleno filled with lobster is definitely some thing I am going to try an recreate in my kitchen. Thanks for posting all these wonderful pictures Jason, I can’t wait to experience Puerto Rico myself some day in the near future! If you live in Puerto Rico, are you not considered an American? That’s a very politically divisive issue and unless you are prepared to go to fisticuffs with the opposite side of the fence that you are on, it’s probably something that should be avoided having an extended discussion about, at least on Daisy’s blog. I’m not a Puerto Rican, so I have no idea what it means to be a Puerto Rican. Certainly, Puerto Ricans are citizens of the United States. But they have their own unique cultural identity aside from their “American-ness” and have fought with the concept of statehood every time their local government has had a referendum on it and its been narrowly defeated each time it comes to a vote. The last time they tried was 4 years ago. It could very well be that some day, Puerto Rico might become a state when the old generation dies and the newer generations start wanting to have the right to vote in Presidental elections and have other protections and advantages statehood gives you. But right now, Puerto Rico doesn’t want it. You both have touched on a very interesting topic that we Puerto Ricans, regardless of where we were born and raised, can become quite passionate about while debating the pros and cons. However, as long as we comport ourselves as civilized compadres respecting each others views and opinions, I don’t think Daisy would mind some healthy repartè on this or any other subject that deals with being Puerto Rican. On the topic of being either American or Puerto Rican, I think the biggest fear Boricuas have is losing their identity while being recognized as Americans. Yes, we are legally Americans by default (decree). Regardless of the title, though, Puerto Ricans, especially those living on the island, are reluctant to accept that moniker because they feel the culture would disappear much like the Taino and Boricua cultures were assimilated when the Spaniards inhabited the island. And while there are myriad signs of Americanization throughout the island, the little bit of cultural identity that is left is fiercely guarded. Regardless of the pros and cons of statehood, the fact that we are a “freely associated nation/state” preserves that separateness from the US (even though it may be just an illusion). As for the question of statehood or independence for the island, THAT subject requires a blog all for itself since there are many internal AND external factors influencing that determination, not the least of which are the reluctance of those on the island (both young and old) as well as those here in the US government. Let’s not kid ourselves – there are political, military, and corporate reasons for the US to keep the status quo. It’s not just up to the citizens of the island to determine their status.